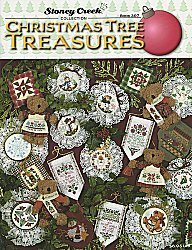 An assortment of 35 delightful cross stitch ornaments displayed in round ornaments, mini stitchband bell pulls, embellishments on stitch-a-teddies, pocket pillows and mitten ornaments. (Stitch Count is listed in parenthesis after each ornament.) Gingerbread Pillow (22w x 25h), Love Snowman (37w x 38h), Joy Snowman (34w x 41h), Santa Star Pillow (22w x 25h), Peace Snowman (39w x 39h), Angel Pillow (22w x 25h), Gingerbread Mitten (38w x 33h), Wreath Mitten (37w x 38h), Snowman Mitten (39w x 38h), Golden Snowflake (37w x 37h), Red Ribbon (39w x 39h), Candy Cane Stocking (42w x 42h), Crystal Angel (37w x 37h), Santa (44w x 44h), Angel (44w x 44h), Golden Tree (39w x 39h), Penguin (43w x 44h), Christmas Star Quilt Block (27w x 27h), Snowflake Snowman (44w x 44h), O Little Town of Bethlehem (39w x 72h), Angels We Have Heard on High (39w x 72h), While Shepherds Watch Their Flock (39w x 72h), Joy to the World (39w x 72h), Snowflake Quilt Block (22w x 22h), O Come All Ye Faithful (39w x 73h), The First Noel (39w x 74h), 9 Patch Star Quilt Block (27w x 27h), Snowflake Lacy (49w x 49h), Christmas Trees Lacy (49w x 49h), Santa Lacy (45w x 49h), Angel Lacy (47w x 49h), Hark! The Herald (39w x 72h), Girl Stitch-a-Teddies (29w x 13h, 33w x 14h, 29w x 16h and 31w x 16h), Teddy Baker (47w x 48h), Boy Stitch-a-Teddies (7w x 23h, 7w x 26h, 9w x 27h and 7w x 23h).